Caption slip reads: "Photographer: Mitchell. Date 1958-11-26. Reporter: Benson. Assignment: Sheriff Eugene Biscailuz. 47: Sheriff Eugene Biscailuz waves his hat Adios. 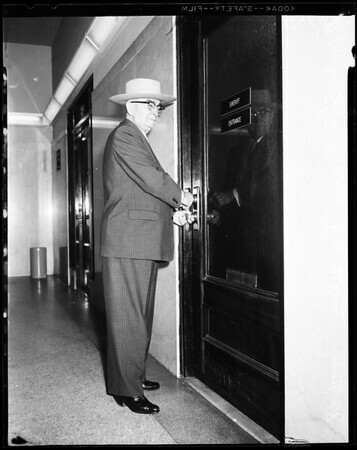 48: Sheriff Eugene Biscailuz locks his door for the last time."